Take your outdoor event to the next level with a party tent rental from A & B Tent & Party Rentals. 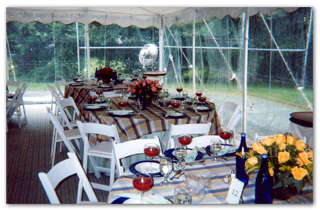 We proudly provide quality and reliable tent rentals to those in Westchester, New York and its surrounding areas at a reasonable price. Regardless of the occasion, we offer a wide selection of tents for any number of guests and at any budget. With a variety of sizes and colors available, we’re sure you won’t have any trouble finding a party tent that fits your own personal style. Going big? Our largest party tents accommodate up to 1,000 people! We supply everything necessary to complete the party planning process, including dance floors, custom lighting and heating, ensuring that your party runs smoothly into the night. For outdoor weddings, we provide everything from the chair to the table settings. To ensure that you choose the proper tent for your space, we offer free, in-home consultations. Email us for more information about our tent rental services!